1962–1966 (also known as "The Red Album") is a compilation album by the English rock band the Beatles, spanning the years indicated in the title. Released with its counterpart 1967–1970 ("The Blue Album") in 1973, it reached No. 3 in the United Kingdom and No. 1 in the United States Cash Box album chart. However, in Billboard, 1962–1966 peaked at No. 3, while 1967–1970 reached the top spot. The album was re-released in September 1993 on compact disc, charting at No. 3 in the UK. The album was compiled by Beatles manager Allen Klein. Even though the group had success with cover versions of songs, most notably with "Twist and Shout", which made number 2 on the Billboard charts, only songs composed by the Beatles were included. As with 1967–1970, this compilation was produced by Apple/EMI at least partially in response to a bootleg collection titled Alpha Omega, which had been sold on television the previous year. Print advertising for the two records made a point of declaring them "the only authorized collection of the Beatles". For the group's 1963 debut LP Please Please Me, photographer Angus McBean took the distinctive colour photograph of the group looking down over the stairwell inside EMI House (EMI's London headquarters in Manchester Square, now demolished). The cover for the 1963 EP The Beatles (No. 1) used a picture from the same shoot. In 1969, the Beatles asked McBean to recreate this shot. Although one of the 1969 photographs was originally intended for the planned Get Back album, it was not used when that project saw eventual release in 1970 as Let It Be. Instead, another 1969 photograph, along with an unused one from the 1963 photo shoot, were used for both this LP and the cover of 1967–1970. The inner gatefold photo for both LPs is from the "Mad Day Out" photo session in London on Sunday 28 July 1968. The British and American versions of the vinyl album contain notable differences; for example, "Help!" on the American edition includes the same pseudo-James Bond intro as the mix found on the American Help! soundtrack LP, while the same song on the British edition does not. Also, the British LP uses the stereo "whispering intro" mix of "I Feel Fine", while the US LP uses the mono mix from Beatles '65, which is drenched in additional reverb. (See Mix Variations below.) In the liner notes associating the songs with their original albums, the US editions referenced the Capitol albums while UK printings used the British albums. The first compact disc version was released on 20 September 1993. It was released on two discs for the price of two albums, though it could have fit on to a single disc; EMI stated that this was done to match the release of 1967–1970. 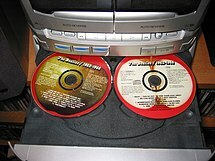 The CD version used new digital masters. The first four tracks on the CD release are in mono; the rest of the tracks are in stereo. The tracks "All My Loving", "Can't Buy Me Love", "A Hard Day's Night", "And I Love Her" and "Eight Days a Week" made their CD stereo debut with this release. The 1993 versions were also issued on vinyl in the UK. The album was reissued on 180 g vinyl in 2014, prepared from the original UK 1973 compilation master. The fake stereo mixes of "Love Me Do" and "She Loves You" were replaced by the true mono versions. Although it appeared on the Vee-Jay compilation Jolly What! The Beatles and Frank Ifield on Stage, this is the first appearance of "From Me to You" on a US Capitol album. "A Hard Day's Night" also makes its US Capitol album debut here, previously only featured on the United Artists soundtrack album. All tracks written by Lennon–McCartney. from US stereo version of Help! ^ a b Haber, Dave (21 November 2006). "Beatles LP and CD Discography". The Internet Beatles Album. Archived from the original on 14 May 2011. Retrieved 20 April 2011. ^ "1962–1966 and 1967–1970". Rolling Stone. Straight Arrow Publishers, Inc. (133): 29. 26 April 1973. ^ ""Mad Day Out" website". Archived from the original on 27 March 2010. Retrieved 20 February 2010. ^ His credit appears in the left bottom corner of the paper sleeve (side 4), but only on the US version of the album. ^ a b c "The Beatles – 1962–1966 - austriancharts.at". Retrieved 3 May 2013. ^ "100 Albums". RPM. 19 (17): 12. 9 June 1973. ISSN 0315-5994. Archived from the original (PHP/PDF) on 2 March 2012. Retrieved 4 August 2011. ^ a b c "dutchcharts.nl The Beatles – 1962–1966" (ASP). Hung Medien, dutchcharts.nl (in Dutch). MegaCharts. Retrieved 3 May 2013. ^ a b "Hit Parade Italia – Gli album più venduti del 1973" (in Italian). hitparadeitalia.it. Retrieved 3 May 2013. ^ a b "norwegiancharts.com The Beatles – 1962–1966" (ASP). Retrieved 3 May 2013. ^ a b "The Beatles > Artists > Official Charts". The Official Charts Company. Retrieved 1 May 2013. ^ a b "The Beatles - Chart history". Billboard. Retrieved 13 May 2016. ^ "Album Search: The Beatles – 1962–1966" (ASP) (in German). Media Control. Retrieved 3 May 2013. ^ "australian-charts.com The Beatles – 1962–1966" (ASP). Australian Recording Industry Association. Retrieved 13 October 2012. ^ "RPM – Library and Archives Canada – Top Albums/CDs - Volume 58, No. 16". RPM. 30 October 1993. Retrieved 13 October 2012. ^ "danishcharts.com The Beatles – 1962–1966" (ASP). danishcharts.com. Retrieved 12 October 2012. ^ a b "Hit Parade Italia – Gli album più venduti del 1993: Altri Albums". hitparadeitalia.it (in Italian). Retrieved 3 June 2011. 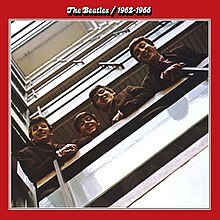 ^ a b "ビートルズ、青盤・赤盤で17年ぶり2作同時TOP5入り" [The Beatles' 'Red' and 'Blue' Albums Enter the Top-Five Simultaneously for the First Time in 17 Years]. oricon.co.jp (in Japanese). Oricon Style. 26 October 2010. Retrieved 3 May 2013. ^ "charts.org.nz The Beatles – 1962–1966". Recording Industry Association of New Zealand. Retrieved 3 May 2013. ^ a b "The Beatles – 1962–1966" (ASP). spanishcharts.com. Retrieved 12 October 2012. ^ a b "swedishcharts.com The Beatles – 1962–1966". Retrieved 3 May 2013. ^ a b "The Beatles – 1962–1966 – hitparade.ch" (ASP). Retrieved 10 October 2013. ^ "Catalog Albums Chart (23 October 1993)". Retrieved 13 May 2016. ^ "ultratop.be The Beatles – 1962–1966" (ASP). Hung Medien (in Dutch). Ultratop. Retrieved 12 October 2012. ^ "Top 75 Artist Album, Week Ending 28 October 2010" (JSP). GfK Chart-Track. Retrieved 4 August 2011. ^ "2010-10-30 Top 40 Official Albums Chart UK Archive". The Official Charts Company. Retrieved 1 May 2013. ^ "Catalog Albums Chart (6 November 2010)". Retrieved 13 May 2016. ^ "Austriancharts.at - Jahreshitparade 1973" (in German). Retrieved 2 March 2014. ^ "Top 100 Album-Jahrescharts" (in German). Retrieved 10 June 2018. ^ "Les Albums (CD) de 1973 par InfoDisc" (in French). infodisc.fr. Archived from the original (PHP) on 27 October 2012. Retrieved 12 October 2012. ^ 年間アルバムヒットチャート 1973年（昭和48年） [Japanese Year-End Albums Chart 1973] (in Japanese). Oricon. Retrieved 31 August 2016. ^ "Billboard.BIZ Top Pop Albums of 1973". billboard.biz. Archived from the original on 4 December 2012. Retrieved 29 April 2014. ^ "Austriancharts.at - Jahreshitparade 1974" (in German). Retrieved 2 March 2014. ^ "Top Discs of '74 (BRMB)". Record Mirror. 11 January 1975. p. 6. ^ "Billboard.BIZ Top Pop Albums of 1974". billboard.biz. Archived from the original on 31 December 2012. Retrieved 29 April 2014. ^ "RPM Top 100 Albums of 1993". RPM. 18 December 1993. Retrieved 2 May 2012. ^ "Dutch charts jaaroverzichten 1993" (ASP) (in Dutch). Retrieved 2 April 2014. ^ "1993年 アルバム年間TOP100" [Oricon Year-end Albums Chart of 1993] (in Japanese). Retrieved 2 May 2012. ^ "Discos de oro y platino" (in Spanish). Cámara Argentina de Productores de Fonogramas y Videogramas. Archived from the original on 6 July 2011. Retrieved 16 September 2012. ^ "Austrian album certifications – The Beatles – 1962–1966" (in German). IFPI Austria. Enter The Beatles in the field Interpret. Enter 1962–1966 in the field Titel. Select album in the field Format. Click Suchen. ^ "Canadian album certifications – The Beatles – 1962–1966". Music Canada. ^ "Danish album certifications – The Beatles – 1962–1966". IFPI Denmark. ^ "Les Albums Platine :" (in French). Infodisc.fr. Archived from the original on 30 October 2012. Retrieved 16 September 2012. ^ "French album certifications – The Beatles – 1962–1966" (in French). InfoDisc. Select THE BEATLES and click OK.
^ "French album certifications – The Beatles – 1962–1966" (in French). Syndicat National de l'Édition Phonographique. ^ "Gold-/Platin-Datenbank (The Beatles; 'The Beatles 1962–1966, Red Album')" (in German). Bundesverband Musikindustrie. ^ "RIAJ > The Record > November 1996 > Highest Certified International Albums/Singles (Mar '89 - Sep '96)" (PDF). Recording Industry Association of Japan (in Japanese). Archived from the original (PDF) on 10 January 2015. Retrieved 2 August 2013. ^ ゴールドディスク認定作品一覧　2010年12月 [Gold/Platinum Certified Awards : December 2010]. Recording Industry Association of Japan (in Japanese). Retrieved 2 August 2013. ^ "The Official Swiss Charts and Music Community: Awards (The Beatles; '1962–66 (Red Album)')". IFPI Switzerland. Hung Medien. ^ "British album certifications – Beatles – 1962–1966". British Phonographic Industry. Select albums in the Format field. Select Platinum in the Certification field. Type 1962–1966 in the "Search BPI Awards" field and then press Enter. ^ "American album certifications – Beatles, The – The Beatles 1962–1966". Recording Industry Association of America. If necessary, click Advanced, then click Format, then select Album, then click SEARCH.